This pass marks the transition between heavy coastal traffic and the start of potentially paradise like cycling over low passes to the north and east. From East. 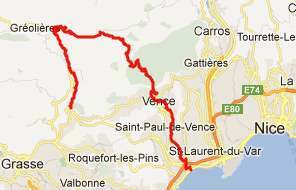 I approached this pass by following the bike path on the coast to Cagnes-sur-Mer, and then followed road signs to Vence. My guess is, that somebody familiar with this maze of traffic knows a million better ways, and none worse. But actually, it wasn't bad, heavy traffic but good shoulder most of the way - and I never had to stop to wonder where I should turn next. Across four lanes of traffic: a nice view of Tourrettes-sur-Loupes, another hilltown. I remembered reading in tourist brochure, saying how essential it was to not miss this town. Actually, the towns on the other side of the pass turned out to be much more appealing. - Or maybe it was just those four lanes of traffic that made it seem that way. In any case - the second picture shows the view without the traffic. In Vence conditions change radically. The traffic stays in the valley. From now on I saw more bicycles than cars. A coastal breeze blew in heavy clouds, turning the scenery into something almost Scottish. The vegetation on the other hand becomes very sparse. I guessed that on top there would be a great view of the sea and a craggy limestone cliff to the east. I could tell I was on top, when I saw all the cyclists putting on their jackets. From West. (described downwards) The road road remains roughly at summit elevation for quite a while and then traverses a section that is a little higher than the pass itself. The vegetation returns quickly. During my descent the wind blew a hole into the cloudy sky. The most memorable scene on this side was the view of the next hill town, Coursegoules (last picture). From point 5 the profile descends further down valley on D6 through the Gorge de Loup to Pont de Loup to maximize the elevation gain. My own route took turned right at point 5, continuing to Greolieres.